The governor reiterates his core policy goals, remaining calm despite audience critics who oppose his stance on aid to immigrants, two voter-approved referendums and other issues. BIDDEFORD — Gov. Paul LePage defended his proposals to cut income taxes and change two voter-approved ballot initiatives before a feisty crowd in Biddeford on Wednesday night. In his first town hall-style forum since the summer, LePage reiterated his long-standing arguments that Maine needs to reduce taxes, lower energy prices and streamline regulations to become more prosperous. But his criticism of ballot initiatives raising Maine’s minimum wage and increasing taxes on the wealthy didn’t sit well with a vocal contingent of the 150-plus people gathered at Biddeford Middle School. “How can you tell the Maine voters that they are too stupid to vote for their own good?” asked Cynthia Handlen of Portland. LePage said that although roughly 6,000 Maine residents saw their wages rise from $7.50 to $9 an hour as a result of the voter-approved wage hike, more than 350,000 elderly residents and others living on fixed incomes will see their costs of living increase. The governor said that although he did not oppose raising wages, he thought the ballot initiative to increase the minimum to $12 an hour by 2020 was “too fast” and argued that indexing future wages to inflation could cause additional harm to the state’s economy. He also predicted that the 3 percent tax surcharge to raise funds for K-12 education, now scheduled to be collected from Mainers earning more than $200,000, will prompt more people to move out of state or discourage young entrepreneurs with families from settling here. “People with money speak with their feet,” LePage said. LePage arrived late but stayed roughly a half-hour past the 7 p.m. scheduled adjournment even as some audience members argued with him or with each other. “I wish it had been a little bit more respectful, but thank you anyway,” LePage said at the end. This was the first time since August that LePage – a two-term Republican – has held a public forum, and marks the resumption of the governor’s regular, town hall-style meetings around the state. 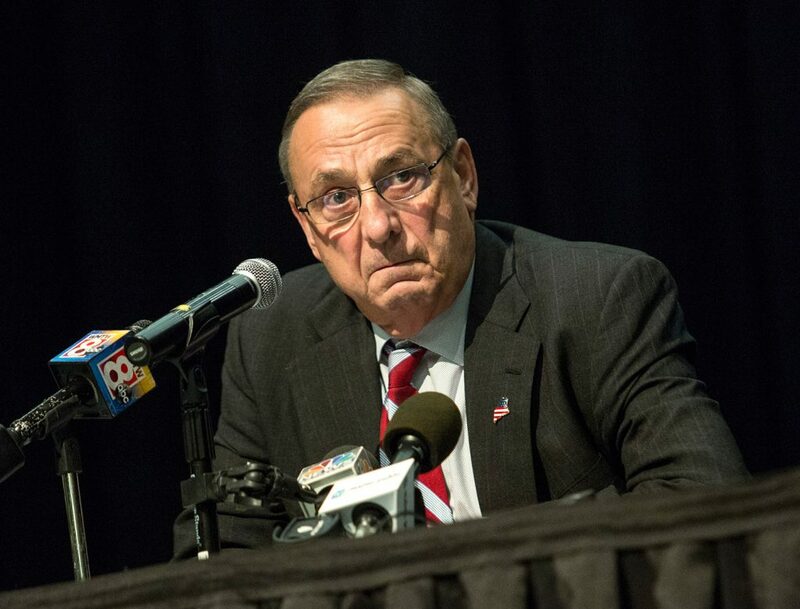 In August, LePage ignited a firestorm with racially charged statements at a North Berwick town hall about drug traffickers and a subsequent obscene voicemail he left for a lawmaker. But the governor is once again hitting the road in an attempt to put public pressure on lawmakers to support the tax cuts, welfare reforms and government downsizing contained in his two-year, $6.8 billion budget. As expected, he also reiterated his calls to eliminate or offset the 3 percent tax surcharge and to phase out the minimum wage “tip credit” for businesses with employees who receive a substantial portion of their income from tips. Voters approved both provisions in November as part of separate ballot measures. One audience member, however, questioned why LePage’s two-year budget seeks to eliminate cost-of-living adjustments for retired teachers and public employees while offering large tax breaks to wealthy Mainers. “You’re penalizing the other 90 percent of Mainers,” the man said. While LePage focused most of his initial remarks on taxes, energy and the ballot initiatives, audience members peppered him with often-critical questions about immigration and other topics. The LePage administration has repeatedly sought to deny General Assistance and other welfare benefits to asylum seekers, whom he often refers to as “illegals.” But advocates for Maine’s growing community of immigrants – and numerous people in the crowd Wednesday – counter that the vast majority of asylum seekers arrive legally in the United States on work, student or visitation visas. “They are not illegal!” one man shouted back at LePage. Federal law allows immigrants to file for asylum within one year of entering the U.S., regardless of how they arrived in the country, and then apply for asylum, as allowed under federal law. But the LePage administration has sought to limit welfare benefits to only those immigrants who have actually filed their applications for asylum. “If they file their paperwork, we are not challenging them,” LePage said. LePage also sparred – albeit calmly, on his part – over his efforts to kill the “net metering” program for those who use solar energy, and his outspoken criticism of solar and wind energy. The governor reiterated that he is “all in” on any energy source, as long as the costs are not above market rates. He also defended his administration’s successes in trimming Maine’s welfare rolls by eliminating eligibility for thousands of able-bodied people – a strategy once again included in his latest two-year budget proposal. “If they are able-bodied they need to work because – it comes down to this – free is going to be expensive to somebody else,” he said.